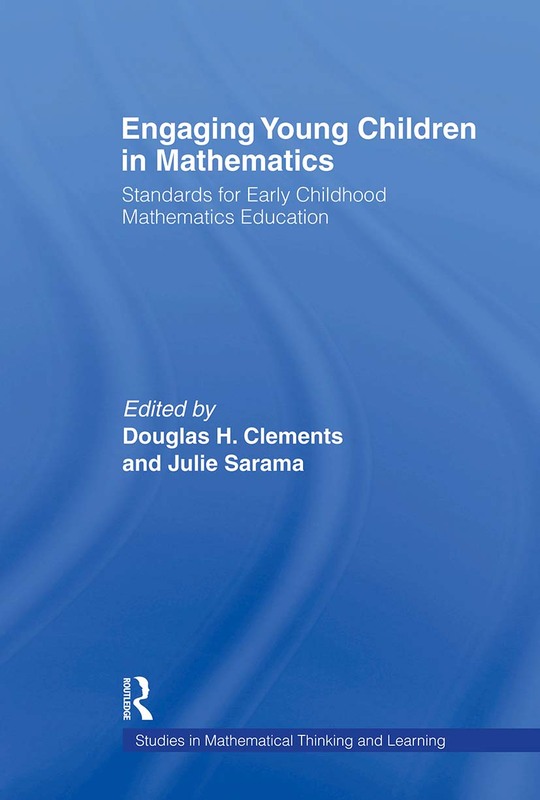 Engaging Young Children in Mathematics: Standards for Early Childhood Mathematics Education brings together the combined wisdom of a diverse group of experts involved with early childhood mathematics. The book originates from the landmark 2000 Conference on Standards for Pre-kindergarten and Kindergarten Mathematics Education, attended by representatives from almost every state developing standards for young children's mathematics; federal government officials; mathematicians; mathematics educators; researchers from mathematics education, early childhood education, and psychology; curriculum developers; teachers; policymakers; and professionals from organizations such as the National Conference of Teachers of Mathematics and the National Association for the Education of Young Children. The main goal of the Conference was to work collectively to help those responsible for framing and implementing early childhood mathematics standards. Although it has its roots in the Conference, the expanded scope of the standards and recommendations covered in this book includes the full range of kindergarten to grade 2. * provides a succinct, but thorough review of research on the topics, sequences, and learning trajectories that children can and should learn at each of their first years of life, with specific developmental guidelines that suggest appropriate content for each topic for each year from 2-year-olds to 7-year-olds. This is an indispensable volume for mathematics educators, researchers, curriculum developers, teachers and policymakers, including those who create standards, scope and sequences, and curricula for young children and professional teacher development materials, and students in mathematics education, early childhood trainers, teacher educators, and faculty in mathematics education. "This book has much to offer those who are involved in developing and implementing mathematics standards in early childhood education." "It is highly recommended for anyone interested in the mathematical education of young children, including preservice and inservice teachers, curricula developers, intervention specialists, and teacher-educators." "This work fills a tremendous vacuum that has existed for many years, taking a close look at early mathematics teaching and learning in a way that reflects both the early childhood and mathematics education perspectives. It should be useful for virtually anyone with a serious interest in early mathematics learning. Two thumbs up!" "This very comprehensive, sound, practical, and detailed discussion on issues related to standards for pre-school and kindergarten mathematics… will be a very influential book for mathematics educators, early childhood educators, and people responsible for policy decisions… It will contribute significantly to the field." Contents: Preface. Part I: Major Themes and Recommendations. D.H. Clements, Major Themes and Recommendations. Part II: Elaboration of Major Themes and Recommendations. Section 1: Standards in Early Childhood Education. S. Bredekamp, Standards for Preschool and Kindergarten Mathematics Education. C.E. Copple, Mathematics Curriculum in the Early Childhood Context. Section 2: Math Standards and Guidelines. K-H Seo, H.P. Ginsburg, What Is Developmentally Appropriate in Early Childhood Mathematics Education? Lessons From New Research. K.C. Fuson, Pre-K to Grade 2 Goals and Standards: Achieving 21st-Century Mastery for All. A.J. Baroody, The Role of Psychological Research in the Development of Early Childhood Mathematics Standards. A.J. Baroody, The Developmental Bases for Early Childhood Number and Operations Standards. L.P. Steffe, PSSM From a Constructivist Perspective. C. Sophian, A Prospective Developmental Perspective on Early Mathematics Instruction. D.H. Clements, Geometric and Spatial Thinking in Early Childhood Education. D.H. Clements, M. Stephan, Measurement in Pre-K to Grade 2 Mathematics. Section 3: Curriculum, Learning, Teaching, and Assessment. K. Richardson, Making Sense. S. Griffin, Number Worlds: A Research-Based Mathematics Program for Young Children. A. Klein, P. Starkey, Fostering Preschool Children's Mathematical Knowledge: Findings From the Berkeley Math Readiness Project. J. Sarama, Technology in Early Childhood Mathematics: Building Blocks as an Innovative Technology-Based Curriculum. B. Casey, Mathematics Problem-Solving Adventures: A Language-Arts-Based Supplementary Series for Early Childhood That Focuses on Spatial Sense. Section 4: Professional Development. R. Feiler, Early Childhood Mathematics Instruction: Seeing the Opportunities Among the Challenges. J.V. Copley, The Early Childhood Collaborative: A Professional Development Model to Communicate and Implement the Standards. J. Sarama, A-M. DiBiase, The Professional Development Challenge in Preschool Mathematics. Section 5: Toward the Future: Implementation and Policy. M.M. Lindquist, J.M. Joyner, Mathematics Guidelines for Preschool. Appendices: Reactions. D. Borkovitz, Afterword. J. Ware, Engaging Young Children in Mathematics. Agenda--Main Conference. Agenda--Follow-up Conference. State Standards. Biographical Sketches.